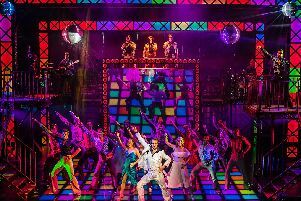 It can be seen at Milton Keynes Theatre from Monday to Saturday October 15 to 20. The show’s creator Derren Litten has written an all new set of Alicante escapades for the much-loved cast members, including Jake Canuso (Mateo), Janine Duvitski (Jacqueline), Adam Gillen (Liam), Sherrie Hewson (Joyce Temple-Savage), Shelley Longworth (Sam), and Tony Maudsley (Kenneth) as they swap sangria for the stage next year after a quick spruce at the Blow ‘n’ Go! Derren said: “I’ve loved ten years of writing my TV show Benidorm but despite a successful writing career I’m first and foremost a performer so have always been secretly frustrated I couldn’t hear the audience’s laughter. Season 10 was broadcast earlier in the year and it has been confirmed it will be the last. Tickets for the show cost from £16. They can be booked by calling the box office on 0844 871 7652 or alternatively visit www.atgtickets.co.uk/miltonkeynes where more details are available.